How about some fast and furious Minimates figure action! Grab this Star Trek Original Series Enterprise Minimates Vehicle! Featuring an opening cockpit and hidden Jeffries tube. Includes an exclusive Captain Kirk Minimates mini-figure! Designed and sculpted by Art Asylum. The Star Trek The Original Series Enterprise Minimates Vehicle is available for some fast and furious Minimates figure action. 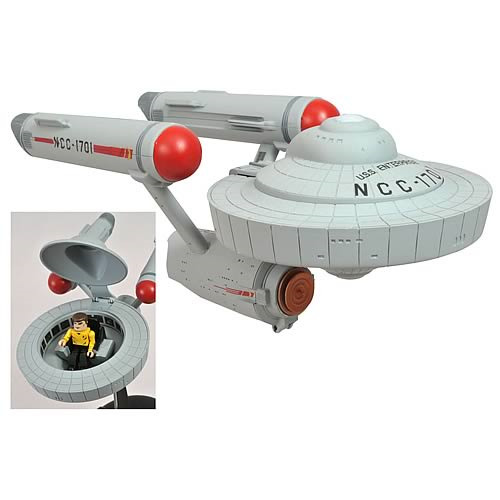 Designed and sculpted by Art Asylum, the starship Enterprise measures 10-inches long and looks absolutely incredible. Featuring an opening cockpit and a hidden Jeffries tube in the engineering section, this amazing Minimates vehicle can hold 2 Minimates figures, one in the saucer section and one behind the radar dish, and it comes with an exclusive Star Trek TOS Captain Kirk Minimates Mini-Figure! Other figures sold separately. Ages 8 and up.